Ever wondered where your blog can take you? Many bloggers aim to make money from their blogs. A few aspire to become probloggers, earning six or even seven figures. Fewer still go on to build a full-blown business behind their blogs that make them millions! A couple months ago, I argued that making big money from blogs now is very difficult, nigh on impossible. But not if you do it the way some of the guys in the list below have! 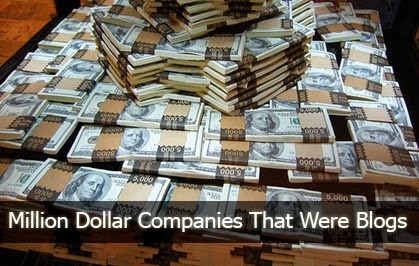 Here are a few multi-million dollar companies that were born as ordinary blogs! Most of you might know about CopyBlogger.com. It is owned by CopyBlogger Media, the parent company for a number of online services and properties including StudioPress, Scribe, Synthesis, Premise, and more! If you're a WordPress user, you should know about StudioPress, creators of one of the most popular WordPress framework - Genesis, and various WordPress themes. The company was originally started by Brian Clark, who was once an attorney. But he transitioned over, and decided that writing was more to his liking than practicing law. One reason CopyBlogger.com does so well to attract an audience is that everything on the site is totally free. Despite one million monthly page views, CopyBlogger.com doesn’t make a dime. Instead, all of their revenue-generating platforms exist on other domains and they use CopyBlogger to make people aware of them. SitePoint.com, a blog owned by Matt Mickiewicz, gave birth to the design company 99designs. It started when designers in the SitePoint community started challenging each other to create the best designs. Eventually, others in the community joined up, and started offering cash rewards for work on real projects. Hence, an idea for a design company was born. Now, 99designs is a 64-person company, and is the world's largest online marketplace for outsourcing graphic design. It has paid out over $38 million to its users. One of the under-used benefits of having a blog is having direct access to a specific group of people. If you ask them and observe their interactions, you’ll find out what they want and what they’re willing to pay for. Then, when you launch, you’ll already have an engaged audience. Many of us know Neil Patel and his wonderful in-depth articles on QuickSprouts! He published his first blog post in April 2007. At that time, he was working on his startup, Crazy Egg, and also working on an internet marketing agency to cover up for the losses he was facing on his startup. Combining his knowledge and experience from these and a few other projects, Patel came up with a new analytics company, KISSmetrics. Neil made a small fortune through his marketing consultancy business, but he didn't like the work. So he started working in the software business instead, which he liked, and excelled at it. This goes on to show what you can achieve if you're passionate about something. Why did I relate blogging to large online companies? Well, as Neil himself says, you can get the most return on investment via blogging - no other business comes close. So if you're thinking about creating the next big thing, consider starting off as a blog, and then build a solid readership which will then feed traffic for your new startup, giving it a jump start. This perhaps is the secret to how these companies became so successful. Sir i need your help i have a blog http://www.evertech.co.vu/ and i want my home page like in your blog you have different categories like mbt tube, make money online, you have different categories and posts arranged in them i also want to do this please help me. Good to know this, except sitepoint i regularly visit rest of the two blog sites....truly if you have dream for something then determination, continuous hard work and believe in Allah, can help you to get your dreams. Where is mashable.com and huffingtonpost.com? These two also started as blog.